A synergistic blend of whole food nutrients and glandular aids that support your endocrine system, immune function, and a healthy response to stress. When the body is under a high level of physical or emotional stress, the adrenal glands may become over-taxed and unable to synthesize optimal levels of adrenal hormones. The result may be dehydration, which interferes with nutrient delivery and contributes to aging and kidney problems. Improper adrenal function also affects the heart, causing a wide range of concerns, including arrhythmia, reduced cardiac output, hypertension and possible heart attacks. 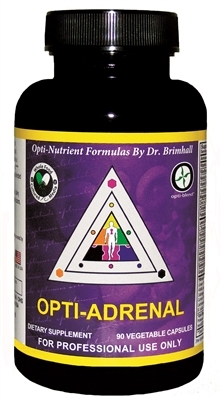 Opti Adrenal is paired with the industry’s only predigested glandular and supportive whole-food nutrients to provide a foundation to best support the body’s response to stress. Adrenal, parotid, thymus, and spleen glandulars are extracted from an Argentinian bovine source that ensures safety and purity. These glandulars are then pre-digested ensuring complete absorption and utilization at the cellular level. The amino acid chelates, along with other chelated minerals, are incorporated into the formula to support immune function, energy generation, and the promotion of suf?cient enzyme activity. Activated whole food B vitamins are present to support energy production in the body and support adrenal gland balance. Whole food vitamin C with bio?avonoids and proanthocyanidins from grape seed extract are provided to support antioxidant systems and metabolic activity. Pre-digested Chlorella is present to support health detoxi?cation. Rhodiola rosea is present to support a healthy response to stress. L-tyrosine is available as a foundation for synthesis of neurotransmitters that the body uses during the general adaptation syndrome.